When I think back about Versailles, I think more of Kings of France than Mid-western fungus. But, despite what I associate with Versailles, Versailles State Park yielded some beautiful spongy miracles for friends and family, today. Awaking at 5:30 a.m., the thought of getting up was overshadowed by the potential trophies that beckoned from a mere 2 hours away. 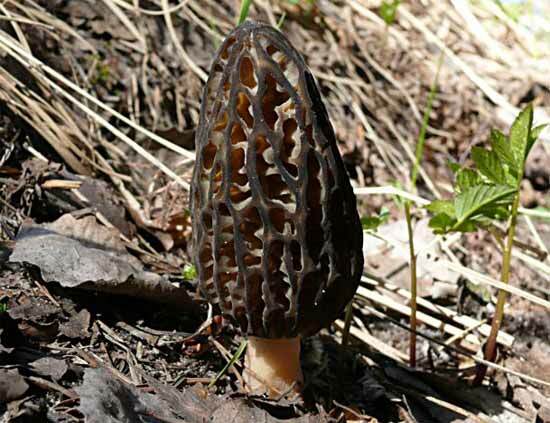 Jim and Marthalea Hill, my parents and I made their annual trip to southern Indiana to find the Morels that are a staple of early springtime, for us. Versailles has been a destination for the Hill's for years and with my parents, the group has made the trip annually. I have gone a few times, but usually had school or work. The day was lousy, for all climatic reasons, and the rain turned to sleet part of the time and finished in a downpour. But, that didn't stop us from having one of the best yields in recent memory. We began the day deep in the state park. I soon found the first one a black sponge, resembling the one here. And I was off. The rest of the day I found mushroom after mushroom. With only a few intermissions of no suceess, We all consistently were finding them. Prior to lunch, I was about to give in for a lack of success (my actions can be described by anyone who has ever fished with me). But, my dad began finding small snake-heads, pepper-tops, or whatever you call them. I soon began finding them lining a log and as two became five, five became 10 and 10 grew to more than 50 in one patch. My white Save-A-Lot bag was more full than I'd ever seen it. And after we finally gave in, in 'the patch' I totalled 106 between my dad and I, in about 20 minutes. After lunch we didn't have quite the success, but capped off the afternoon with a few black sponges and some sleet. After leaving a banana peel on the trail, in comic hilarity (to myself), we ran for the car, dodging the flying ice, and made our way to the Osgood Grub Co. prior to heading home to showcase our little wonders.